Statistics show that many families are just one life crisis away from poverty. Since 1968, Sweetwater Mission (formerly C.A.M.P.) has been dedicated to preventing hunger and homelessness in the Cobb county area. The Mission, made up of a coalition of local churches, businesses, civic groups, and caring individuals, stabilizes families by providing basic needs and transforming lives through education and employment opportunities. The mission is responsible for distributing nearly one million pounds of food in 2016. 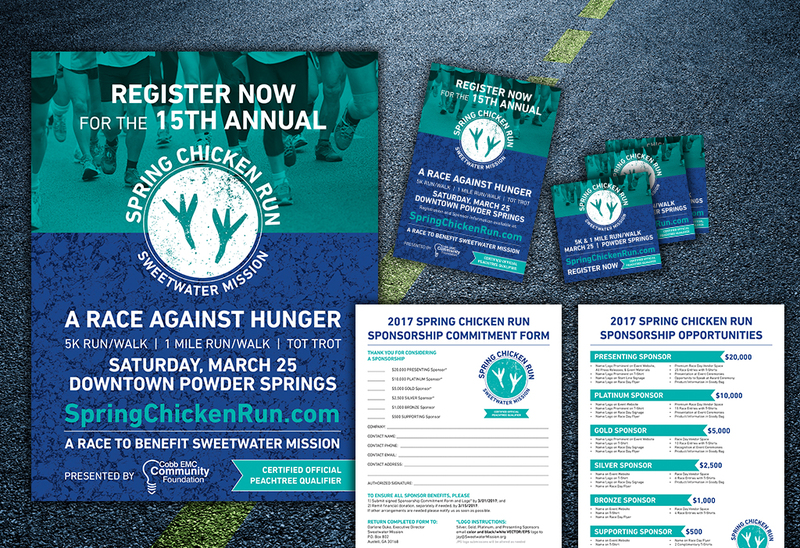 Since 2003, the Spring Chicken Run: A Race Against Hunger has provided an opportunity for the Atlanta community to support Sweetwater Mission. 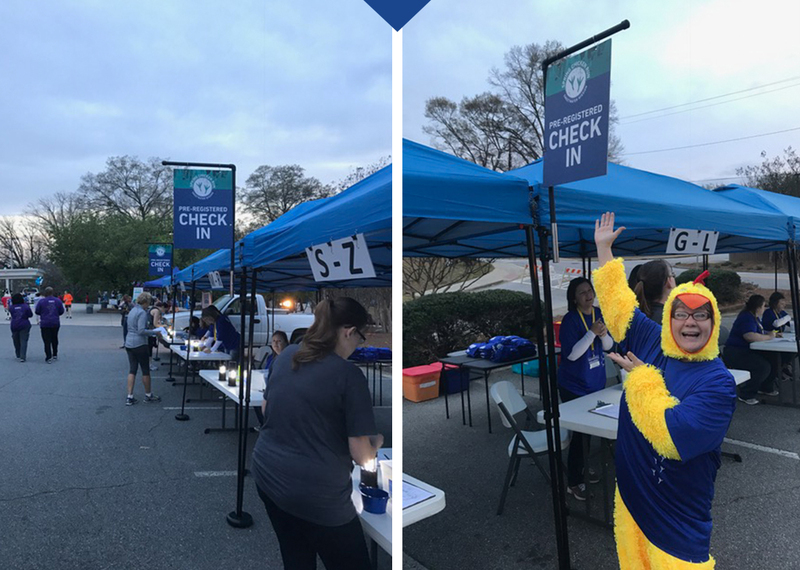 The event, which starts in Historic Powder Springs, Georgia and winds its way through the community, includes a 5K Run/Walk, a 1 Mile Run/Walk, and a Tot Trot. In 2014, id8 partnered with Sweetwater Mission to assist with increasing brand awareness of the organization. It was our privilege in 2017 to help refresh the Chicken Run brand to reach a larger audience. At that time, the only branded item at the event was the race t-shirt. 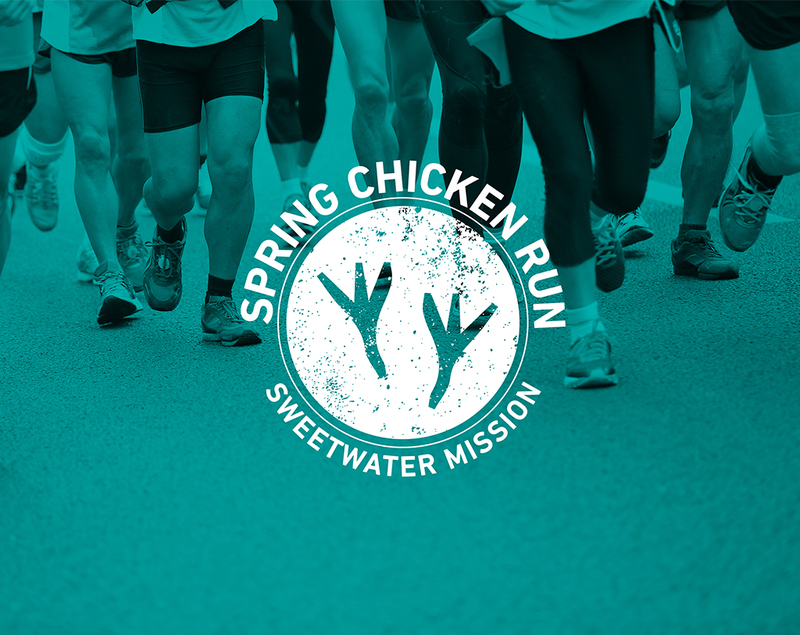 The id8 team came up with a fun, internal design contest to propose “Spring Chicken” logos to Sweetwater Mission. Once the logo was chosen, the “winning” designer partnered with Sweetwater Mission to complete the remaining branded materials. id8 designed a sponsor packet, web graphics, email graphics, stickers, flyers, a barricade cover, signs, banners, a t-shirt, and posters and assisted with designing the look and feel of the website. The 15th Annual Spring Chicken Run was a huge success. It was a beautiful day for a race, participants and spectators were excited to be there, and our friends at Sweetwater Mission were beyond happy with all of the newly branded materials and the increase in awareness they fostered. “Working with the team at id8 from the very beginning and up until the day of the race, we could not be more pleased with the overall concept and of the new Spring Chicken Run brand. You held my hand when necessary, and let me run loose when appropriate.